Within the catalogue of rights, whether conceived in constitutional or international terms, economic and social rights are said to be especially indeterminate. This Article inquires into the conceptual foundations of a minimum core of economic and social rights. 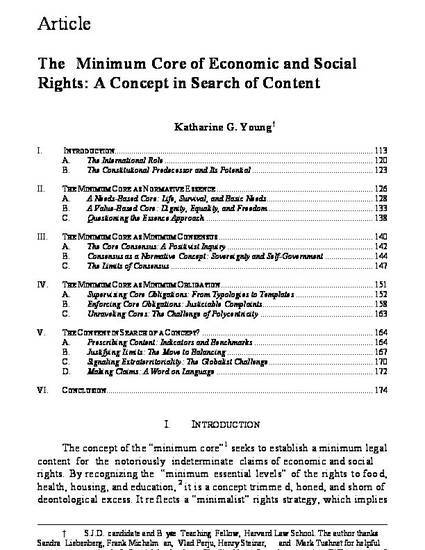 The concept of the minimum core has been applied to provide determinacy and even justiciability to the rights to food, health, housing, and education, and also (most ambitiously) to give substance to minimum legal obligations in both national and global distributive justice debates. This Article brings together the methodological insights of comparative constitutional law and international human rights, and traces the ways in which concepts are borrowed from each field. By doing so, this Article disaggregates three contrasting approaches to giving content to the minimum core - that of ascertaining the normative essence, minimum consensus or minimum obligation of economic and social rights. This Article further demonstrates how each approach is ultimately unable to provide an account that satisfies the proclaimed aims of the minimum core's proponents. It ends by gesturing towards alternative ways of approaching a universalized discourse of minimums in economic and social rights.